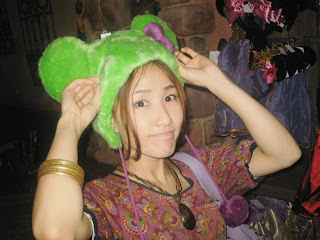 megyu,in: ★Disney Sea in 2 years. ★Disney Sea in 2 years. *Trying on a knit cap at a store. Last week, i visited Disney Sea in 2 years, and loved it a lot. in this time i really enjoyed every atractions there,too!! We entered the land around 11:30pm (which is very late time for disney fan), though we could see and get on abour 9 attraction(which is pretty good!!). The longest line was less than 2 hours, and we could use fast pass as well, so we could try as many attraction as we could in shourt time very efficiently !! I think , Disney sea is lass crrowded than disney land, and also the restaurants and attraction there were much more for adults. Disney sea is only in Japan, so when you visit here, plases try to visit another majic land in Tokyo :-D.